Firefox 54.0 has been released on June 13, 2017 to the stable channel. The new version is offered through the Firefox web browser's automatic update functionality, and also provided as a direct download from Mozilla's website. All other Firefox channels, those are Beta, Nightly and ESR, are also updated. Mozilla did remove the Aurora channel from the release cycle when Firefox 53 was released. Mozilla enabled multiple content processes for Firefox's multi-process architecture for the majority of eligible systems. The number has been raised from 1 to 4 content processes. You can check out the Firefox 54.0 preferences changes here. Firefox Stable is configured by default to check for updates automatically. The browser's automatic update feature will pick up the Firefox 54.0 update automatically, download it, and install it on most Firefox systems. Firefox queries Mozilla's servers for update information. Depending on how the browser is configured, if an update is found it may be downloaded and installed directly, or on user request. The big new feature of Firefox 54.0 is support for multiple content processes. Firefox's multi-process architecture has been integrated in previous versions of the Firefox browser, but up until now with only one content process. What this means is that all websites and services open in Firefox at any time use the same content process. Still good in terms of reliability of the browser as the browser ui is running in a separate process, but not as good as separating these into multiple content processes. Chrome for instance uses one process per site. Firefox won't do that, and the main reason why is that it impacts performance and memory use too much. Mozilla picked four content processes as the default for the switch. So, once Firefox is updated to 54, the bulk of Firefox installations with multi-process enabled, will use four content processes instead of just one. Double-click the preference, and change its value to a positive integer. This is the number of content processes that Firefox will use. Moved mobile bookmarks folder to the main bookmarks folder. 5.1 surround sound playback is enabled by default on all desktop versions of Firefox. The network request summary and the performance analysis view list the transferred size now. Support for VP9 codec in encrypted streams using Clear Key and Widevine added. VP8-encoded webm/video media playback is supported always now, regardless of system performance (previously not allowed if system was considered to be not fast enough). HTTP/1 pipelining is no longer supported. Veteran Firefox users may know related preferences from speed up articles that are a decade old, or older. Developers may add custom devices to the Responsive Device Mode of the developer tools. WebExtension APIS: Sidebars, New Tab Page customization, custom protocol registering, and custom DevTools panels. Bookmark sync performance has been improved. Bulgarian (bg) and Kabyle (kab) locales added. More reliable audio and video playback. File names are preserved correctly on upload. Formatting for right-to-left languages fixed. Security information is released after the release of the update. We will add the information once Mozilla makes it available. Display issue of tab title, opening a new tab, opening multiple tabs, and downloading files. 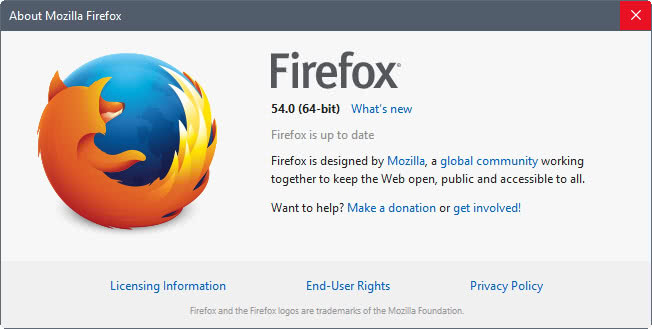 Firefox 54.0 was released on June 13, 2017 to the stable release channel of the Firefox web browser by Mozilla; Beta, Nightly and ESR were also updated. On the first date that Mozilla releases a new version of Firefox, they release it to 25% of their audience. Besides downloading directly from their FTP repository, is there a way to force Firefox to update once the new version is released? Going to the About Firefox menu and selecting Check for Updates does not work until Mozilla releases it to 100% of users (or you are part of the 25%… not sure how they determine that). Hey Tony. You can download the .mar files directly, which are downloaded by the Firefox browser itself once it knows an update is available. Those are either partials (if you already use the last official version) or versions with the full application, the latter of which are only downloaded if a partial update fails or there’s none available for your current browser version. The method of updating the browser that way is a bit tedious (see the links below) and not nearly worth it for these incremental updates with no major new features, but if you want to do the work by hand, then you’ll know how to do so. That’s very useful. Thank you! As you mentioned, too much of a PITA to do all the time, but definitely worth knowing. Hopefully Mozilla will make it easier in a future release to manually force an update. BTW, do you know how they decide who is in the first 25% to get the update? Hey Tony, in reply to your question about staged rollouts: on Android, Mozilla uses the built-in functionality of the Play Store for that (see link below). I don’t know exactly how this works with desktop versions, but since Firefox doesn’t have a unique identifier to the best of my ability, it only leaves random chance, the less unique user agent string or the used IP address as potential control methods. That being said, I don’t know of (m)any updates that have been held back or withdrawn entirely, but I’m kind of glad not to be an early bird with software updates ;) Yeah, in terms of bugfixing it could provide a crucial advantage, especially regarding security fixes, but for anything else less so. Mozilla uses their telemetry to see if a recently released updates also introduces major crash spikes in the statistical data and if that’s the case, they can stop the faulty code from going out to the other 90 or 75% of all users. Thank you Dan! Great info. No need to fuss with update files. One more benefit from more processes. It looks like for Task Manager that Firefox uses less RAM. Exactly. 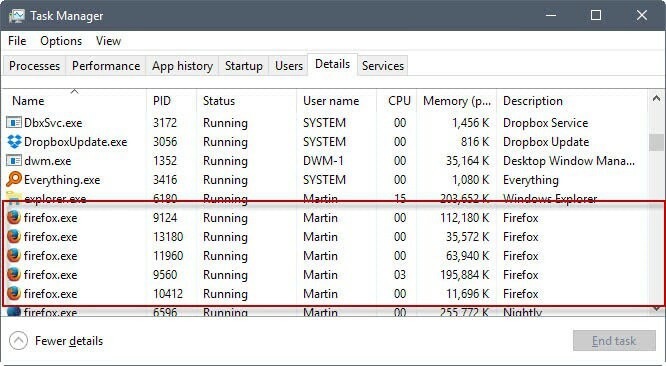 Maybe the task manager in the future versions of Windows should group same processes and show them as a single one with total memory usage and adds a + that you can click to expand it. I got message that Firefox uses to much RAM. (I have 16GB RAM). I look in task manager Firefox x64 uses 2.5 GB of RAM memory total. I look for Chrome. Every tab from one web site take 2GB of RAM and I opened several tabs with this web site. Black sheep is Firefox when actually it’s Chrome. I wonder when will they ditch that Maintenance Service, or at least intergrate it in the browser or conceal it more. Firefox is the first browser that I’ve seen that needs a separate program to help it update. It only runs on demand anyway and is required to avoid the user getting UAC prompts on upgrades , and I am pretty sure Chrome has a separate update process running continually. Chrome does, but unless you delve into things, you won’t know it exists. Also if you delete the Chrome updater, it can’t update anymore unless you reinstall. I think Vivaldi originally didn’t have anything, but now it has a tool that works separately that can alert you for updates even if the browser is not working, but the good part is you can customize it in settings if you want you to alert you when Vivaldi isn’t running, i.e. running constantly on its own, but then again Vivaldi is so bare bones at this point it doesn’t matter, maybe by 2.0 it will be usable. I very much like that I can install Firefox without installing that maintenance program by ticking off a checkbox during installation. Wouldn’t want that to change. These things are a security issue and since I don’t update but instead uninstall/reinstall, I don’t need them. Not all users are bumped to 4 processes right now. You can just force it via setting dom.ipc.processCount to 4 in the interim if you want. So it’s random? Nothing to do with what you have installed? Anyway, Ok.
@jupe: I know, but because this is kinda major change, I’m afraid to turn it on manually. Perhaps it will start consuming more resources ( CPU/GPU ) without being able to realise it. The multiprocess is gone. xD It wasn’t even integrated in the browser, it ran as a separate plugin… what a joke. Hay Martin, I have just upgrade main 32 bit (On a 64 bit Windows 10 system) Firefox to version 44. I have by following the easiest way I know off to find out whether the multi-process Firefox where enabled by: Loading about:support in the Firefox address bar and locating “Multi process Windows” under application basics near the top. This said it was not activated (Disabled). Main first of two question to you is:can I activate it on main 32 bit Firefox 44 version or do I have to start a 64 bit version for that? And main second question is is it already prudent to do so and I should better wait to a little while to see or there it already thew developed and there are no snacks, around the corner? It seems that Firefox 52.2.0ESR is STILL not released yet, no matter how many hours I’ve waited! When will Firefox 52.2.0ESR be released?! I use FF 52 ESR. 52.2.0 was released by Mozilla yesterday so I updated. Click on “open menu” (Hamburger top right). Click on the ” ? ” at the bottom of the menu. The current version of FF is displayed. If there is a newer version, Mozilla will offer to update FF. You do NOT have to hunt around the internet looking for updates. I left out the last instruction. When the ” ? ” menu is open, click on ” about Firefox “. The current version is then displayed with an offer to install any available FF update. Anyone else seeing that behaviour, or have I misunderstood something? Klaas, not for all users. I think the ratio is 80/20. What is the new Pending Pings folder used for? I’m pretty sure its for telemetry pings that are pending. I wouldn’t worry about it. Wow.. this thing is fast & with no ad blocker none the less. I’m impressed. For me, version 54 is much slower than its predecessor. Painfully slow. > Chrome for instance uses one process per site. Firefox won’t do that, and the main reason why is that it impacts performance and memory use too much. Impacts performance and memory too much? Firefox is designing their web-browser for computers that are a decade old. The only people I know that are running Firefox (because of performance reasons) are people who are still on a 32bit OS. I left Firefox because its performance was so bad. So what is Firefox thinking when they say enabling more than 4 processes impacts performance and memory too much? Chrome blows Firefox away in performance. It’s why everyone is using Chrome and not Firefox. I want Firefox to succeed, but they shouldn’t be making design/performance decisions based on technology that is a decade old. Are we using the same browser here? I usually open 10-15 tabs when browsing and I don’t notice performance problem. With Chrome I get lag when opening that much tab, not to mention they don’t even have scrolling tab feature, the tabs are shrinking to the point they don’t have title on it. Everyone is using Chrome the same way everyone used IE way back then, casual users just use browser with 1-2 tabs. They won’t notice Chrome become laggy because of that. You can try it yourself, try to open 10 tabs on Chrome and look at the cpu and memory hog at the task manager. > I usually open 10-15 tabs when browsing and I don’t notice performance problem. With Chrome I get lag when opening that much tab, not to mention they don’t even have scrolling tab feature, the tabs are shrinking to the point they don’t have title on it. I use Linux, so maybe that explains it. I get tons of lag and slow performance, a lack of responsiveness when using Firefox. I get none of that using Chrome. I’ve installed FF 55 beta. uMatrix 1.0 is not working anymore. I’ve set “xpinstall.signatures.required” to “false” but FF still doesn’t let me enable it. Works fine in latest Nightly. No I had it always from Github. Wonder if they will update the unbranded build in a timely manner this time, it’s still on 53.02. Something else to consider when wondering why Mozilla doesn’t plan to allow as many processes as Chrome is that they are going to pick the multi-threaded route with Servo components, starting from Firefox 57 assuming no delay. It’s a lot more efficient and flexible. Full blown processes are useful security wise, but have many drawbacks. It’s good to have them, a number of them, but past some point the costs outweigh the benefits. Not the case with multithreading in a thread-safe language like Rust. > Full blown processes are useful security wise, but have many drawbacks. It’s good to have them, a number of them, but past some point the costs outweigh the benefits. Not the case with multithreading in a thread-safe language like Rust. I’d love to read more about this. Is there any literature that talks about what this “past some point” is? I’ve noticed zero problem using Chrome. Whatever Chrome is doing is not producing something I notice. Maybe I’m not reaching that point, or maybe it’s something else. Finally my Group Speed Dial will be able to override the new tab page! Good job! Hello, how can I set content processes to 4? I’ve tried to set dom.ipc.processCount to 4 but it didn’t change anything. Thanks Julien, setting browser.tabs.remote.force-enable to true did not work? I wonder what Tom Jones would say but be sure there’s at least one other Tom totally agreeing with you! Updated Firefox ESR to version 52.2.0 and will stick with ESR, hence be free of the “road to 57” odyssey until the end of the expressway : spring 2018. We’ll see then, meanwhile, relax max. Can’t tell that anything is different on macOS 10.12.5 (Sierra). I updated to v.54. I checked dom.ipc.processCount and it was still set to “1”. I manually changed it to “4” and restarted the browser. Then I opened several tabs. I opened Activity Monitor (the macOS “Task Manager”) and there is only one Firefox process. No matter how many tabs I open, just one Firefox process. Ah, I just checked about:support and it says “Multiprocess Windows: 0/1 (Disabled by add-ons)”. Now I’ve just got to figure out which one. Anyone know of add-ons that do this? I’m going to guess it has something to do with a hidden extension called, “Multi-process staged rollout”. I can’t find where to disable it. The add-on ‘Add-on Compatibliity Reporter’ will show which add-ons are Not compatible with multiprocess. Too bad it doesn’t flag those that are not yet ‘Webextension’ compatible. A handy script for all versions of Firefox : ‘e10s compatibility preview’, shows you (on AMO) whether an addon is e10s compatible before installing. available at greasyfork. Completes the Firefox57-ready notifications. I now have 2 processes when Firefox is running, previously I had 1. Do you have more than 2 tabs open? I’ve just tried with 2+ tabs open and it doesn’t seem to make any difference. Only 2 instances of firefox.exe are showing in the task manager. Great, now where under the download button it would tell you the file size and the domain you downloaded it from and the time of the download, now it just says “completed”. They fucked it up. And i’m still waiting for enough UI customizability to restore normal UI without Classic Theme Restorer eating my CPU (or whatever it does that makes FF slower). I can also see in about:support page (Thank you John, wasn’t aware of this internal page). The problem, that no one at Mozilla seems to acknowledge, is that the more Firefox changes to look like Chrome, the more the usage slips. People want the speed of Chrome, and possibly the number of add-ons, but almost no one I know likes the newer interface changes. If people like that they usually move to Chrome or a work-alike. So it seems that the only ones who like the changes of the past couple of years are on staff at Mozilla. If they want to have this on their epitaph, then they should move ahead with deliberate speed, otherwise, some time to evaluate where they went wrong, and who was responsible for the errant coding, would seem to be in order. I always install the latest version of FF on my Mac, just to see how heavy on CPU and battery life it is. Sadly, Mozilla have completely neglected this part of their operations – whereas Chrome has made very significant progress in recent versions. So much so that it is now fairly close behind Safari for energy efficiency. I can put up with FF’s quirks, but what’s the point of doing so if it cuts my battery life by half? Sad. Firefox cuts your battery life by half compared to Chrome? That much, really, or is “half” only a way of expressing a feeling? Half seems a lot. I’m sorry but I do not believe you. If FF did do this, there would be a lot of complaints in Mac ( and PC ) forums. You’re right, “half” is more of a manner of speaking. Nevertheless, FF has a very significant impact on my battery life, with the battery percentage meter visibly going down and the Activity Monitor’s Avg. Energy Impact at a very high level compared to other browsers. Not sure why you don’t believe me. I have never had this problem on my Win10 laptop, but there seems to be something wrong with how FF works on macOS. I’m using the top-build late-2016 MacBook Pro with Touch Bar, and FF’s average energy impact (in the Activity Monitor) is consistently the highest of all browsers I’ve tried. This includes Chrome and Opera, which seem to have a significantly lower impact than FF. Battery life percentage is visibly and rapidly dwindling with FF, which is much less the case with the Chromium browsers. I know Chrome has a reputation for being a resource hog, but they’ve really upped their Mac game since around version 56 or so. Finally, FF has a pretty low market share on the Mac (compared to Win/PC) and most Mac users would be using Safari or – in some cases – a Chromium browser. Maybe that explains the lack of outcry, even though I do remember seeing various threads on this topic on Mozilla forums and others. Firefox has become very sluggish since they introduced that agile development cycle, if that is how they call it. Their code is unpolished, full of bugs, memory holes etc. I remember the earlier Firefox versions and they were snappy as hell, much faster than even Chrome is today. Then they started adding various junk to Firefox, and now you get a slow, crappy product. And I see that they discontinued Windows XP support on the latest version, what a good decision that is for them – maybe financially – more sponsors now they want to promote that Winblows 10 spy product. What is with the trend of removing Windows XP support for applications and more recently even Windows Vista and 7 ? And let’s avoid that saying “Windows XP is an unsecure, old, unsupported product” bla bla whatnot. By which standards that is the case ? I’ve been working on Windows machines for the past 14 years, both in administration as well as low level analysis and debugging, and may I venture out to say that Windows XP can be made to be one of the most secure Windows editions now, bear with me. For those who know how Windows functions on a low level basis (let’s try to avoid the unfounded marketing and technical nonsense MS promotes in media), you have many systems that can be an attack vector including DCOM/RPC, various active-X, browser and explorer shell components, filesystem drivers and filters etc. On Windows XP you have a clear view and a clear path on how to disable/remove and deal with those systems, making for a very hardened and secure operating system acceptable for use in even the most strict environments. Try doing that in Windows 7, 8, 8.1, Windows 10, and you are in for a bad surprise, crashes, black screens and totally unusable OS. And take a look at those tracking / tracing and logging systems they introduced, your computer is a treasure trove of hidden tracking and logging – NTFS self-healing, USN journals, metadata – NTFS transaction store, various logging components, keylogging components, statistics subsystems and other c*ap. I wonder why that is the case – intentional of course, because those services and subsystems are made that way so they can do what they want with your computer and then sell it as an improvement. Since newer Windows products are so good, why not use them in planes, fighter jets, critical medical equipment and such :) Yeah, I thought so, true specialists know how things really are, they are not crazy to do it. In which technical capability or manner are newer Windows versions better ? They are not faster, far from it, they are not more stable in any way, Windows XP drivers are more polished than drivers for any other Windows OS out there. Do newer Windows versions provide better networking – simply said no, with their simply badly tuned networking stack that you have to manually peddle with, in order to get it to play nicely. And for those that say you have more security features in newer OSes, and support for more RAM (x64 XP has support for RAM over the x86 limit), that is just being uninformed or plainly not interested in being informed. DEP, ASLR, UAC and other so called security features are a joke, and easily bypassed by even the most benign of viruses, let alone by some nasty stuff out there. Simply said, from a standpoint of technical prowess, compatibility, security, performance, usability and productivity none of the new Windows versions are better than Windows XP. MS just wants to sell you smoke and vaporware, but if you want, go ahead and throw your hard earned money on MS s*itware. And Mozilla, good luck promoting Firefox as the time goes, it will be abandonware soon, unless of course they have started selling user data to various third party companies for a nice profit (and I do not mean search results, searches, and such). I find Firefox snappy to use, I never have lag or screen shudder while scrolling etc, have you honestly tried it lately?, it has changed a lot since v4 when it did have problems. I have been running the Nightly version since v4 (Minefield) and find it a lot more responsive than Chrome. Yes, I have. It is not always slow, but when I need to open a 100+ tabs for various technical stuff I need information on, there is a screen/render lag and you can clearly see that it is having trouble rendering the amount of content – I have tested Chrome on the same hardware and there is a significant speed difference – try opening a site that dynamically loads image content as you scroll down. On Firefox as the amount of content on screen increases, it starts lagging, which is not present on Chrome. I have even implemented all of the tweaks mentioned on Ghacks user.js file, and I have been doing so even before they appeared here, I even keep my own list updated by browsing the Firefox code repository to spot Firefox preference changes. And by the way I am using a RAMdisk for Firefox cache to rule out any latency/delay issues present, due to slower hard disk read/write speed, and access times. While I don’t have an issue with XP, when will you consider it OK for Microsoft and other vendors able to cease support on Windows XP? When, in your mind, will vendors allowed to push towards the next version so that newer compilers and features can be used? When is it OK for Microsoft to say, “OK if you want to remain supported by us, we need you to be on the current product line so that we can streamline support?” When will that be that OK for you? Technically Vista, Windows 7 and 8x are better in a couple of ways. First the component store (although criticized for its gobbling up in disk space) actually works to prevent more BSODs, but using hardlinks to point to different system file versions; that way newer and older Windows applications can by run side by side. That’s a biggie. The breadcrumb pull down menus that allow you to choose a folder directly from the address bar in Windows Explorer makes navigation a tad easier. Newer Windows versions can utilize more newer CPUs natively than XP can. Aero offloads video rendering to the GPU and leaves your main CPU to do real work. Advanced Format HDD compatibility allows bigger sectors to be utilized for faster disk performance. I saw buggy drivers when Vista was first release, but even that was cleaned up by SP1 and SP2.. I’ve had very few driver issues on Windows NT 6x based systems. What is it that you’ve experienced? Windows XP x64 was a terrific system, but isn’t there some sort of addressing issue I heard about for systems populated with more than 16 GB of RAM? Have to check that one. UAC (although I hate it) was just meant as a way for general end users to be aware if something questionable was about to run on their systems, and for a user to be involved in what runs or not. That’s all. It’s amazing that in 1995, very few people had a problem with Windows 95 pushing aside Windows 3.x, but they just can’t let go of XP. Why can’t Microsoft market new systems? Why can’t Microsoft aim for profit? To be honest there simply are no benefits to the business or the end user when Microsoft switches to a new compiler – they started using .NET some time ago, and it is not faster or better in any way than pure C++ which Windows XP was purely running on – I know because we measured the performance in multiple instances – and yes newer C++ versions can be run on Windows XP as well. And when you mention Microsoft support – I can hardly call that support, I had contact with them at least a 100 times by now, and oh is there a pattern there – it is fully outsourced and I would not give them a permission to replace my light bulb let alone some of the more important stuff out there – they simply do not have the knowledge nor technical capabilites or simple logic / reasoning to fix anything outside of the stuff that is listed on their HOW TO list – step 1, step 2, step 3, and if it is not on the list – then you are out of luck, with the exception of the US/UK engineers if you ever manage to get redirected to them. I agree with you on the component store, but that simply was the easiest way for them to solve that, but not the best, and definitely not the most efficient one, as they cause filesystem clutter. Almost all new CPU extensions are fully supported on Windows XP, with the exception of some that can hardly be used by both ordinary consumers as well as most businesses. CPU support is a matter of a CPU drivers in all Windows versions so that should be rather easy for MS to correct – the customers are paying them a rather hefty sum afterall. Advanced format unfortunately does not have any effect on performance regardless of which OS you are using – and all new disks have native hardware 512 to 4k sector conversion so the differences are a statistical error. New CPUs are so fast that rendering your application/windows user interface on a CPU is effortless, and will not spend even a 0.5 % of CPU usage. Aero is another marketing gimmick, another fancy thing for MS to add to a list of failed features – in my experience the first thing you need to do on new Windows versions if you have GFX glitches is disable Aero – so much for that. And in terms of drivers, newer Windows versions – especially Windows 8, and Windows 10 have extreme issues with drivers, especially with GPU drivers – from my own experience servicing stuff, and from many other users banging their head with GPU issues, on a system that should simply work right out of the box. Regarding Windows XP x64 16 GB issues, a system fully updated with PAE enabled has no problems with handling the full RAM supported as per the MS specs. UAC is useful when a legitimate software wants to use it and follow the MS way and procedure. But when a virus wants to do damage, it will not ask you nor UAC if it will run, or what action it will take. I agree that every company needs to make profit, MS as well, but oh man do they make it, and do they make it big, much bigger than before, but they deliver a half assed, half baked product just so they can squeeze out each cent – their development and code quality is a joke from a technical and design perspective. Just look at the footprint of Windows XP/Windows Server 2003, and look at the footprint of the newer OSes – it should be clear to the ordinary guy, let alone to some of the professionals out there, that the footprint is the result of inefficient, unoptimized code, because they skimp on development costs – this is the reason they moved to .NET in the first place – why not use pure C++ (must better speed, much less resource usage) – but you need more time to code, and of course more qualified professionals – which want to be paid for that quality. Anyways, if you want a fancy, shiny new product, full of gimmicks and useless stuff, including kernel code integrated spyware that logs all your keystrokes and sends them out to the big bad wide net then ok – imagine the reaction of a certain SMB when you tell them they need to buy an enterprise grade 50k USD firewall (that can block all of the spyware stuff in Win 8 /10, in order to be definitely secure) in order to prevent an OS that costs 200-300 USD per machine, from spying on them – good luck selling them Windows 10 then. Technically and financially most businesses will stay with old systems because they are field proven, they are stable, do not require much investment, and they simply work. Cost wise, it is again more cost efficient to keep the old system – and invest in network and data security, if that is their worry, as this is the main point MS makes when promoting new systems, they claim they are more secure – I work in this field as well, and I must tell you they are definitely, completely, utterly, whatever you call it, simply not. Imagine having to deal with your OS being a sort of a virus, besides being hit by all sorts of viruses and malicious application that exist today. Since the new version was released v54 and i updated … the SPEED SUPPOSE TO BE … faster .. well guess what it is not it’s even worce … not sure what you f9ck up .. but it’s big time… i wait for a webpage to load some 20-30sec even more … and i’m on win 10 pro .. with all drivers etc updated etc…. total disaster … i love the browser but if you f8ck it up like this … how to use it … i knew i suppose not to update but the message that pop up on random is so so so so aarr annoying..
Well I’ve installed the latest x64 Nightly build which is v56.0a1. Some observations. I was set to 4 processes out of the gate. I set mine to 7. It’s working well in that respect. Mind you, it is using more RAM than I’m used to. Nightly uses 1.6 GB for the ten tabs I have loaded. Pale Moon using the same ten tabs uses 511 MB. All of the Photon features developed thus far have been enabled, including the new hamburger menu at the top right, which no longer shows the pictorial choices. It’s now a longer menu. The transport buttons are similar to the Photon mockups that Martin posted awhile back, but are fixed. So when I tried moving the “home” button between the refresh button and the address bar, it was no go. I did manage to find code that I placed in UserChrome.css, that allows tabs to go under the address bar. I hope I can do that in v57, because that will allow me to forgo Classic Theme Restorer. Which brings me to a final point: Extensions. I tried to see if there were any WebExtensions that I would find useful. Right now, I can’t find one for uBlock Origin, so instead I’ve installed the “legacy” uBlock extension. My understanding though is that it will be converted to one by its author. The main point is that if I can source a WebExtension for uBlock, then I won’t need any legacy extensions. I want to see if I can happily exist in a WebExtensions post 57 world. If the finished browser will be anything like this Nightly installation I have going, I think I can. Do you have any problems with its hardware acceleration feature? No I don’t have any issues. What is the issue? Do you think that Nightly 56 is the last Nightly who would support legacy add-ons? Have the old network.http.pipelining hacks been phased out (perhaps because of the new parallelism code)? All of those options appear to have been removed in 54.